On the lookout for a rustic-esque-industrial ambience, Whup Whup came perfectly in line with their expectations. “Since we are both in the aviation industry as pilot and flight attendant, we decided to include that as a theme in our wedding. And since it was the week of Christmas, we spiced things up with some Christmas touch to it,” the bride shares. Thanks MCS Wedding Gallery for sharing with us this set. Guided by their vintage botanical theme of neutral hues, greenery, and a touch of dusty blue and gold, Charis and Joshua put together a DIY wedding at the church where they grew up – Church of the Good Shepherd. It was indeed a labour of love for the couple and their friends, as they created the calligraphy musical backdrop, signs and wedding invitations. Many thanks to Bloc Memoire Photography for these precious memories! Weddings are a celebration of a couple’s union, but they are also in large part about the people who have been a part of that journey. We are always glad to see couples search for unique ways to appreciate their loved ones. What a pretty confluence of the couple’s interests and influences! This British-Indian inspired wedding theme, set against the autumn palette of forest green, marsala, gold, beige and dusty blue, culminated in a setting that gave the guests a marvelous evening, as intended. Many thanks to Nigel Lim for capturing this set of photos. Eucalyptus leaves, chosen for their scent and deep green colour, were the main decorative point for this wedding, and what a beautiful way to tie the décor together! From the cake and the decorations to the bouquets and the invitations, hues of blush pink contrasted beautifully against the rich green shades. Set against the backdrop of a classic church that was filled with natural light, this wedding was simple yet elegant, nature-focussed yet modern. The couple looked absolutely breathtaking in their attire and every bit in love with each other. Many thanks to Bloc Memoire Photography for this beautiful set of photos! The wise bride is one who knows what matters and who does enough so that the venue doesn’t steal the limelight. With that heart-shaped arrangement anchoring the ceremony setup and the bridal table serving as the focal point of the evening reception, this wedding, beautifully captured by Ben Yew Photography, did everything just right. High ceilings and wooden decorative elements make for a perfect rustic vintage wedding, what more if some of the wooden details were actually crafted by the groom himself? This couple chose to personalise their wedding in a very special way, and complementing their wooden décor was a gorgeous colour palette of dusty blue and soft pastel pink, all brought together with touches of gold. Many thanks to hellojanelee Photography for capturing these wonderful moments – from the joy and laughter right down to the amazing décor! Don’t forget to play the beautiful video from Motion in Style. The best thing about having a DIY wedding is that no matter what, it becomes very closely personalised to your own style and story. This couple was no exception, from involving their friends and family in the process to rummaging through their parents’ old knick-knacks. (They found some real gems!) We loved the relaxed vibe and casual décor, complete with the loving smiles of the newlyweds and their guests. Thanks to Memoir Click Studio for this pretty set of photos. We love it when we see a couple’s nuptials reflect their personality, and for Jason and Constance, their wedding showed their deep love for each other, their down-to-earth personalities and the joy they wanted to share with their loved ones. The bride knew that she wasn’t a traditional ‘girly’ bride and chose to don a two-piece with oxfords instead of the usual bridal gown and heels. We think she looks fantastic! 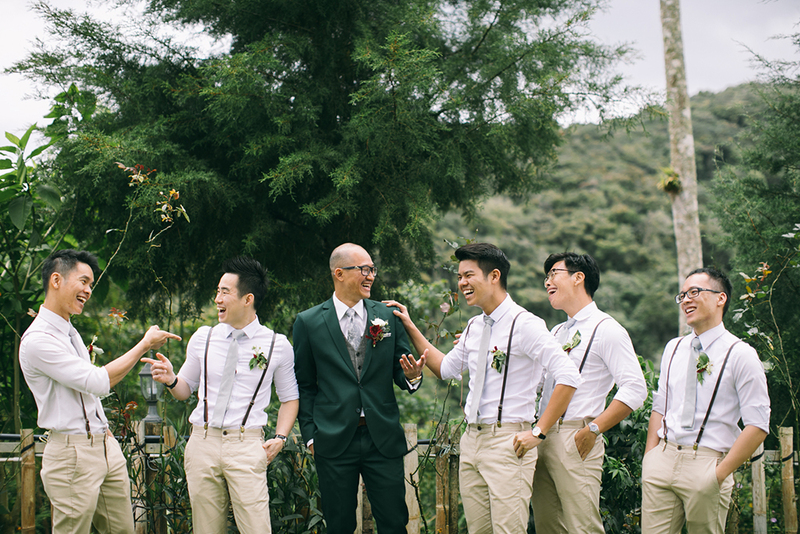 Thanks to Samuel Goh Photography for capturing these special moments.